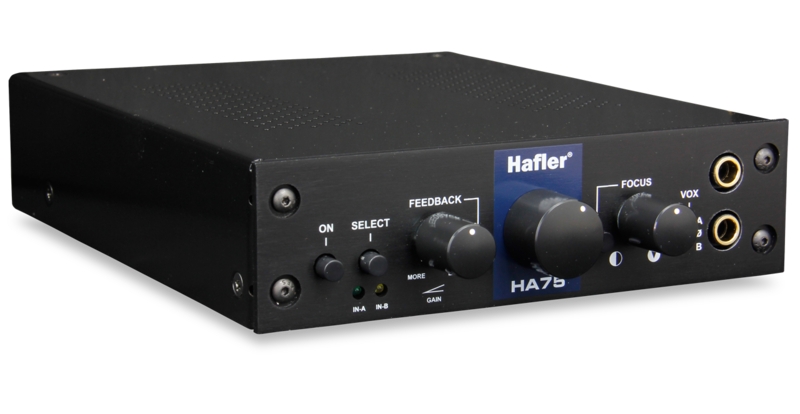 The Hafler HA75-DAC is an audiophile tube-based headphone amplifier and USB digital-to-analog converter, with a number of useful and innovative features that excite and enhance the listening experience. The uncompromising design of this amplifier builds upon the foundation of the original HA-75, which has received praise from many of the ‘golden ears’ of the recording industry for the incredible clarity, warmth, and character provided by its tube-based topology. 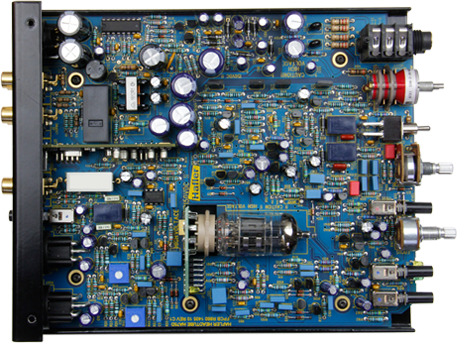 This same circuitry and 12AX7 tube is employed on the HA75-DAC, with the addition of a USB input for monitoring high-fidelity digital audio up to 192 kHz. Analog inputs are provided via RCA and balanced XLR connectors, and a selector switch on the front of the HA75-DAC allows you to easily switch between analog and digital sources. A number of additional features allow you to tailor the performance of the HA75-DAC to suit both your listening style and your headphones. The Focus control simulates the experience of listening to speakers in a room, using an active matrix that can be dialed in according to taste. 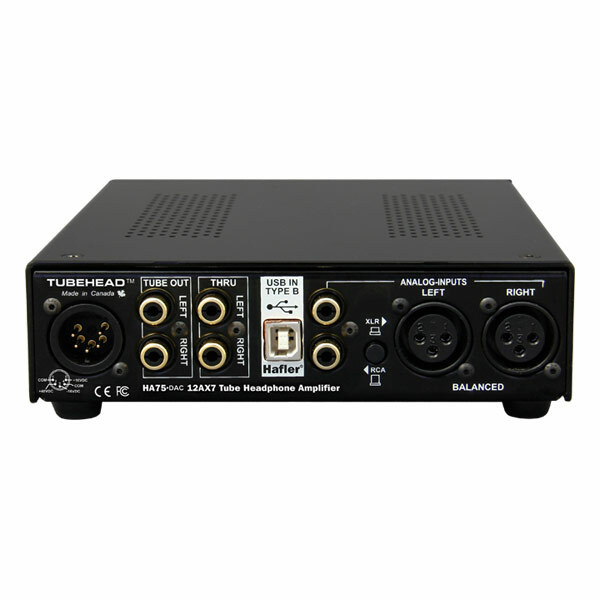 A three-position voicing switch allows you to adapt to the balance of your headphones or the source material by applying a loudness curve or enhancing the bass response; the voicing circuit can also be bypassed for a neutral response. Another exciting addition is the load selector switch, which allows you to tailor the output impedance to match any pair of headphones available. 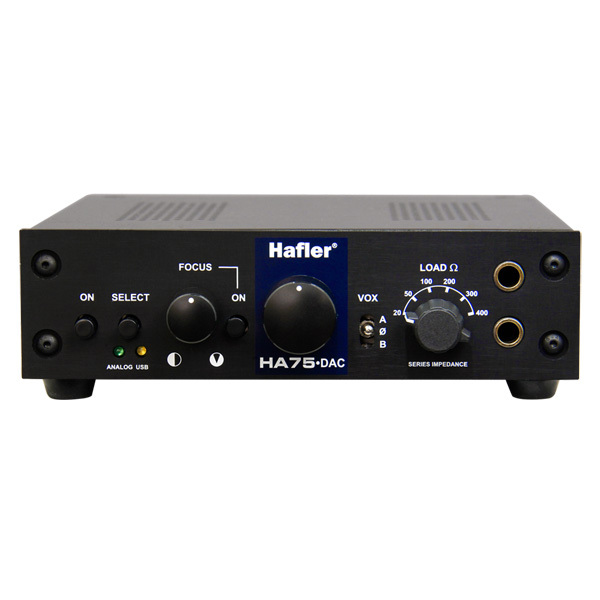 The chassis of the HA75-DAC is built from 14-gauge steel to block stray magnetic interference, and the back panel features gold-plated RCA connectors to ensure optimal signal transfer. 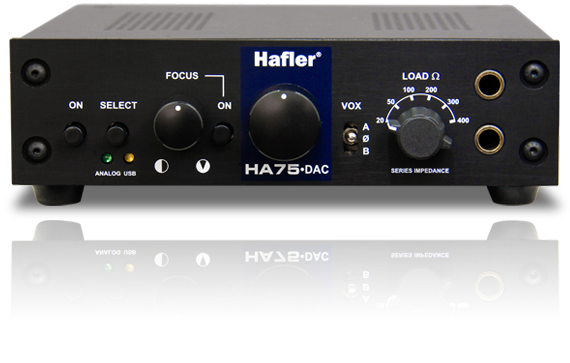 Additional ‘thru’ and ‘tube out’ RCA outputs allow you to use the HA75-DAC to feed another input device, or connect between a preamp and power amplifier to impart the character of the 12AX7 tube. The HA75-DAC blends superior engineering with powerful user-controlled features to provide an exceptional and unique listening experience, allowing you to enjoy your music like never before. 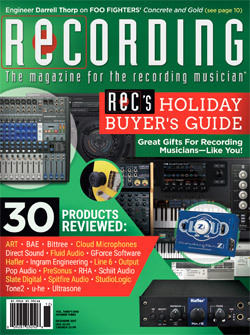 Selectable RCA or balanced XLR connectors. Dual triode 12AX7 tube operates in stereo with a B+ voltage that reaches 140 volts to deliver the warm sonic advantages of a tube without excessive distortion. Instead of today’s popular surface mount ‘cell phone’ parts, the HA75 uses full sized resistors and capacitors that are hand inserted to deliver the very best audio quality. Glass impregnated nylon XLR connectors are tougher than steel, feature extra-large nickel-silver pin contacts for positive connection that will not tarnish over the years. Can the HA75-DAC damage my hearing? Yes. Any time you are subjected to long periods of high sound pressure levels, you can damage your hearing. Always monitor your kids' listening levels and consult local health and government safety regulations to ensure you stay within safe margins. What is the benefit of tubes? Tubes introduce warm-sounding even order harmonic distortion that is pleasing to the ears. This is why most audiophiles prefer the sound of tubes over solid state counterparts. The other benefit is the distortion acts like a natural limiter. This tends to reduce ear fatigue. Do I need to warm the HA75-DAC up before using it? Yes. It takes about 15 minutes to achieve thermal stability. This of course produces a better sound as all of the components reach their optimum temperature. Why did you incorporate a voicing switch? Some will argue that true audiophiles may never use this function. However, when listening to music at low levels, bass energy can become too low. The loudness switch allows the user to add more bass to suit. This also allows users that enjoy listening to accentuated bass to share in the fun. Why an external power supply? External power supplies enable manufacturers to ship the same product around the globe without having to pay costly safety certificates. This makes the product more affordable for the end user. Further, power supplies tend to be the part of the circuit that is most subject to fail. This makes servicing easy. Finally, power supplies generate a ton of noise. This is particularly troublesome in small boxes. So removing the power supply lowers the noise floor. Can I plug my iOS and mobile devices into the USB input? The USB input on the HA75-DAC was designed to connect to laptop or desktop computers for high quality digital audio playback, and it is not supported by iOS and mobile devices. Do I need drivers to use the HA75-DAC with my laptop? 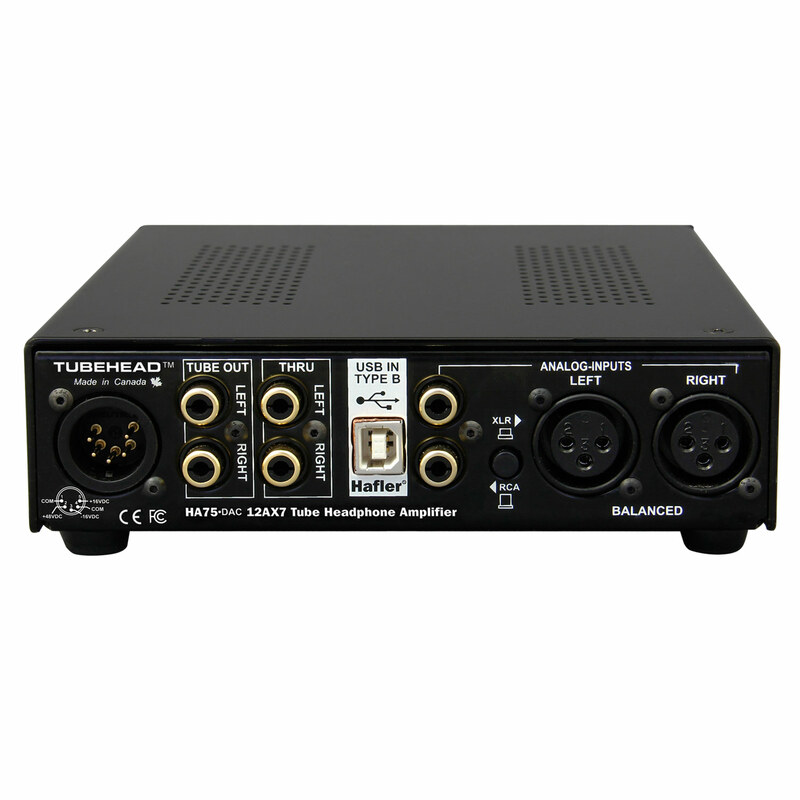 When using with Mac computers the HA65-DAC is a plug and play device, with no drivers required. Computers running Windows will need drivers to use the HA75-DAC. 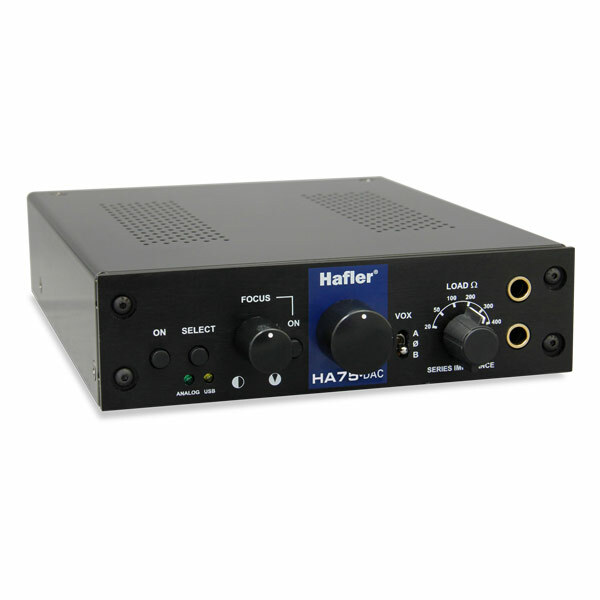 These are available from the Hafler driver downloads page. 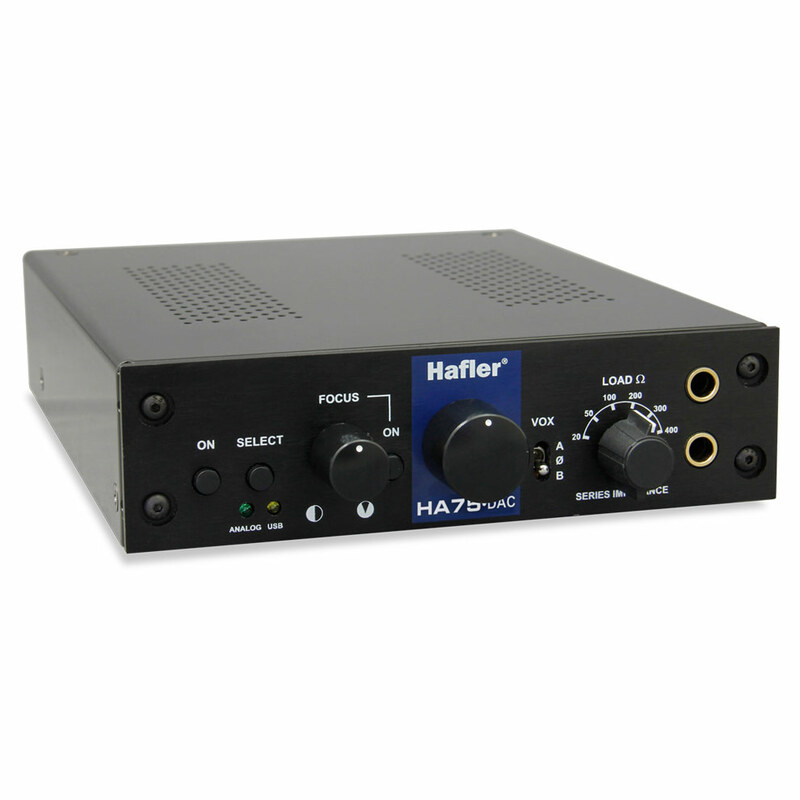 What bit depth/sample rates are supported by the HA75-DAC? 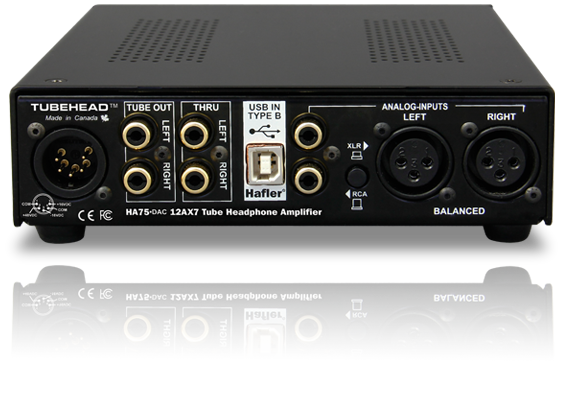 The HA75-DAC is capable of playback resolution up to 24bit/192kHz. How do I set the load impedance for my headphones? The load impedance selector allows you to vary the output impedance to optimize performance with any pair of headphones. The best way to use this feature is to trust your ears, test out various settings, and choose the one that sounds the most pleasing to you. These amplifiers sound amazing! As a listening experience, they’re both simply exquisite, and I’d recommend them to a user who’s more interested in “creative listening” than in perfect accuracy, simply because it’d take a lot of work to settle into a reliable reference sound.